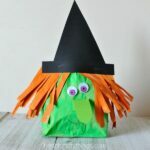 Did you know you can make a darling witch paper craft out of a black triangle, some circles and a few rectangles? It reminds me of our fun paper Santa craft we made a few years back but instead it’s a perfect paper craft for Halloween. 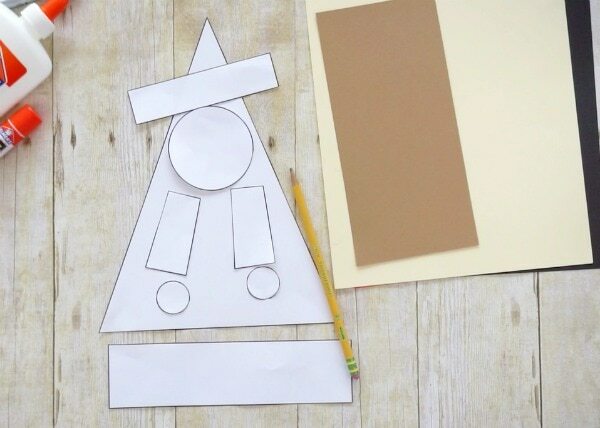 Using shapes makes this a fantastic craft for preschoolers and Kindergartners too! 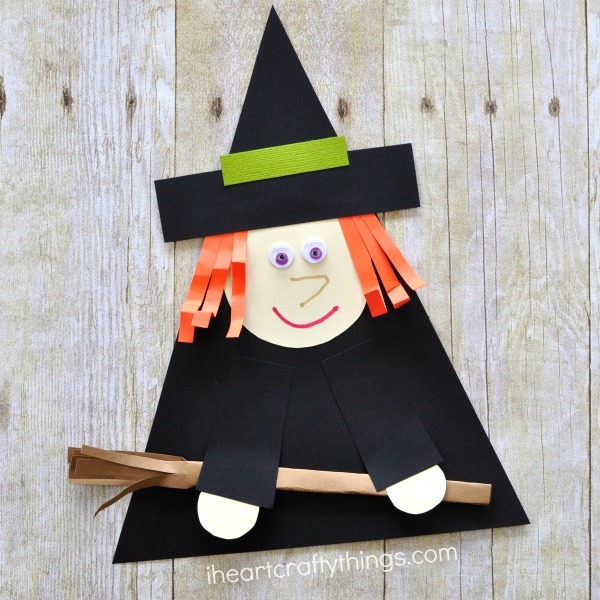 (optional) Witch Paper Craft Pattern <—-Find this in our TPT store. 1. 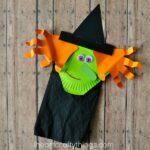 To simplify prep for this fun witch paper craft we have created a pattern you can purchase in our Teachers Pay Teachers store. We truly appreciate you supporting our website! 2. Cut out the pieces of the pattern and trace them onto your colored cardstock. Cut out the traced pattern pieces. 3. If you choose not to use the pattern you’ll need a large black triangle, a black rectangle for the witch’s hat and two black rectangle arms. From your tan cardstock you’ll need to cut out a circle face and two circle hands from your tan cardstock. 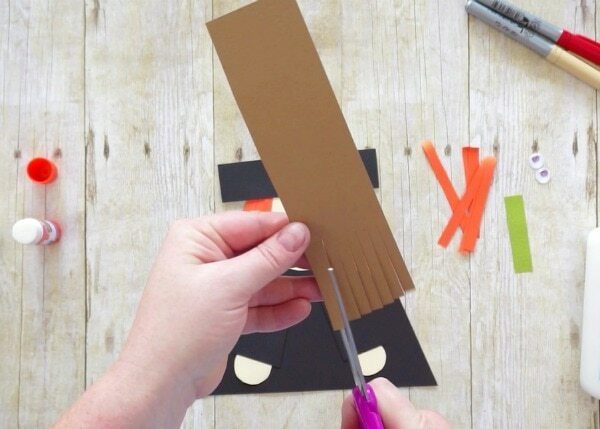 Then from your brown cardstock cut out a a rectangle for a witch broom. 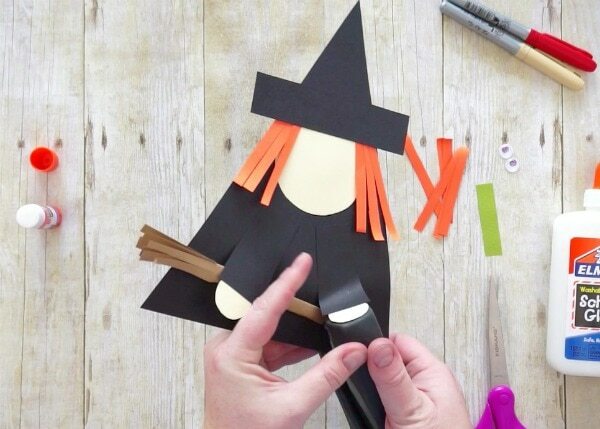 From your orange construction paper cut out several small strips for witch hair. 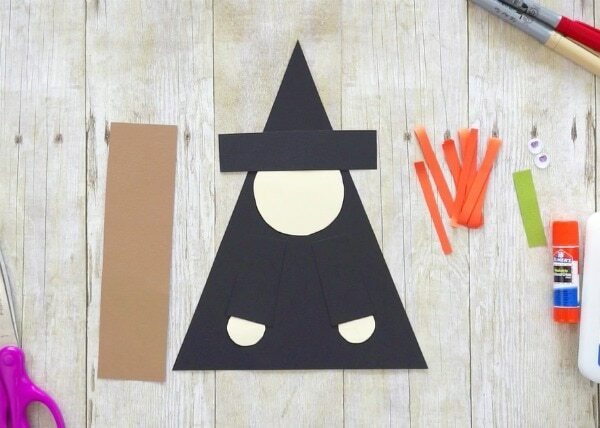 You can also cut out a small rectangle to put on the witch hat. 4. Glue the tan witch face a few inches down from the top of the black triangle. Then glue hair on the sides of the witch face. Next glue the black rectangle at the top of the face to make the witch hat. 5. Glue the two small circle hands under the black arms. Glue them onto your black triangle but leave the hands unglued so you can place the broom underneath them. 6. Use your scissors to cut small slits along one side of your brown rectangle. Roll and fold the rectangle up to form a witch broom. Place the broom underneath the witch’s hands and staple it in place. 7. Glue your small colored rectangle onto the witch hat. Then glue your googly eyes onto the witch face. 8. 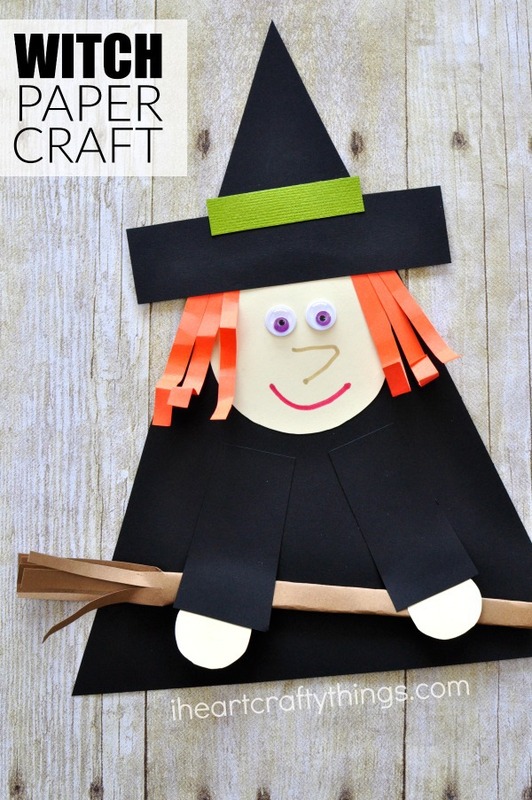 Finish your witch paper craft by using markers to draw a nose and mouth onto your witch. Your Witch Paper Craft is complete! Wouldn’t these be darling hung up on a classroom bulletin board for Halloween?! 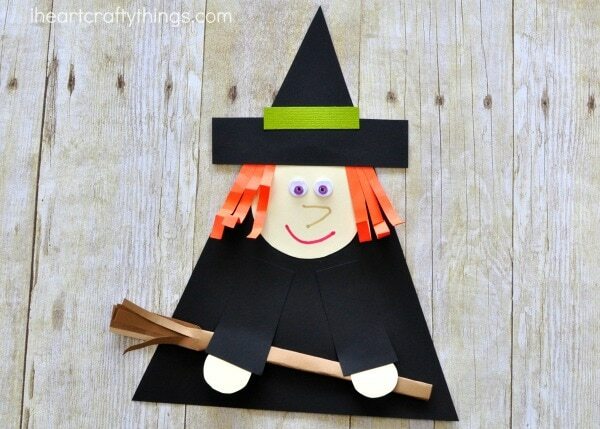 You can also pair this cute witch paper craft with the popular book, Room on the Broom by Julia Donaldson. Looking for more fun Halloween paper crafts? 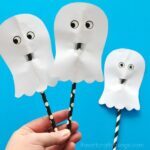 You’ll love this simple and cute paper ghost craft! These accordion fold paper bats are also fantastic for Halloween.